A very affordable classic car. Car is advertise elsewhere. Needs to be viewed to be appreciated. Stacks and stacks of history. I bought full service stuff to do a full service and I bought timing belt, water pump, Tensioner set, oil filter, engine oils, coolent, gearbox fluid ,sparkplags ALL GENUINE HONDA PARTS. HONDA CIVIC 1.4i S AUTOMATIC PETROL. V5 is present. This is a lovely car with genuine mileage of only 42,442 miles. It has just been given a full MOT lasting till 3rd May 2020. The rear seats easily fold down giving a surprisingly large loading area. Also the right hand outside mirror is fixed in position rather than being any longer movable. 5 DOOR, MANUAL, 1.6 PETROL, NEW MOT UNTIL APRIL 2020, LOW MILES ONLY 41K, 2 KEYS, ONLY 2 OWNERS FROM NEW, HPI CLEAR, FRONT & REAR ELECTRIC WINDOWS, ALLOYS WHEELS, CD PLAYER, DRIVERS SPOT ON, NO KNOCKS OR BANGS, SMOOTH DRIVE, GOOD CONDITION INSIDE AND OUT, READY TO DRIVE AWAY TODAY AT ONLY £1299 7 DAYS VIEWINGS CALL FOR MORE DETAILS ON 07828164061 OR 07592112655. CAR RUN AND DRIVE REALLY GOOD SAVE FUEL DUE TO LPG GAS SYSTEM. TOP LINE 49000 LOW MILEAGE. Bristol Autos Limited - Call us on 441179926557 or click here to find out more. Dealer Direct Cardiff - Visit us for a test drive - Call us on 442920108606 or click here to find out more. The Si edition features 16" diamond cut alloy wheels, sporty skirting and bumpers, rear privacy glass, front fog lights, leather steering wheel and gear knob. MS Auto's - Call us on 441372236172 or click here to find out more. 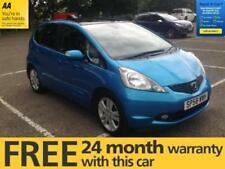 Honda Jazz 1.4i-DSI ( sr ) SE, 5 DOORS HATCHBACK. MR CARMAX LTD. - Visit us for a test drive. Please make an appointment to avoid disappointments. - Call us on 442038895291 or click here to find out more. 45000 Miles. 2010 HONDA JAZZ EX I-VTEC. Full Service History (stamped in service book). (Very clean car that drives as new, must be seen and driven to be appreciated). AM FM Radio. Multifunction Steering Wheel. Mot till March 2020. Honda Jazz 1.4 S.E. Petrol engine 2010 46340 miles. One lady driver from new.